To donate product, or to inquire about receiving food for your ministry, contact Procurement and Distribution at (559) 397-0472 or email bruce@gleanings.org. Gleanings For The Hungry is a volunteer-run, non-profit 501(C)(3) organization dedicated to feeding the hungry physically and spiritually. Gleanings full time staff is not paid a salary; each staff member is responsible for raising their own support. Gleanings functions strictly on donations. By partnering with Gleanings you will impact people’s lives. All your donations go to feed the hungry. If you have special requirements regarding your donation, we will work with you to meet your requirements. Organizations donate a wide variety of products, such as: potatoes, pasta, dehydrated vegetables, rice, beans, peas. With the help of our volunteers, we use donations to produce and package soup mix, then in co-operation with our ministry partners, ship the food to feed the needy in over 80 different countries. Other shelf-stable food donations are given, such as: energy bars, cooking oil, flour, nuts, and raisins. All products donated will feed the needy. Do not hesitate to call us if you have something you are willing to donate. Gleanings also welcomes donations of vehicles, tools, and equipment that can help us produce and distribute the food. All donations are tax-deductible. KENYA. 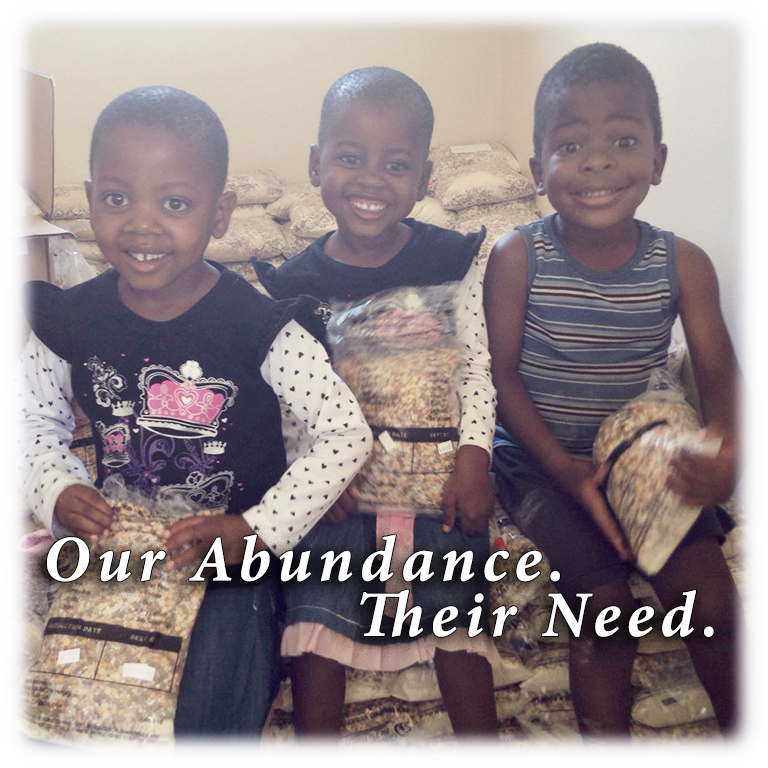 A partner ministry who distributes our food in Kenya brought about more than relief to hunger. The Pokot and Turkana communities once raided each other, stealing cows and goats, sometimes resorting to killing for animals. A long-needed bridge brought peace between the two warring communities as they came to receive food from a common point. ZAMBIA. Beatrice Muleya was widowed in 1999. Four of Beatrice’s 12 children have died since. Beatrice’s small two-room house accommodates 17 grandchildren of various ages. One room serves as both kitchen and bedroom for the grandchildren. Beatrice used to depend on well-wishers to help feed her large family. Because of her health challenges, generating income proved impossible. 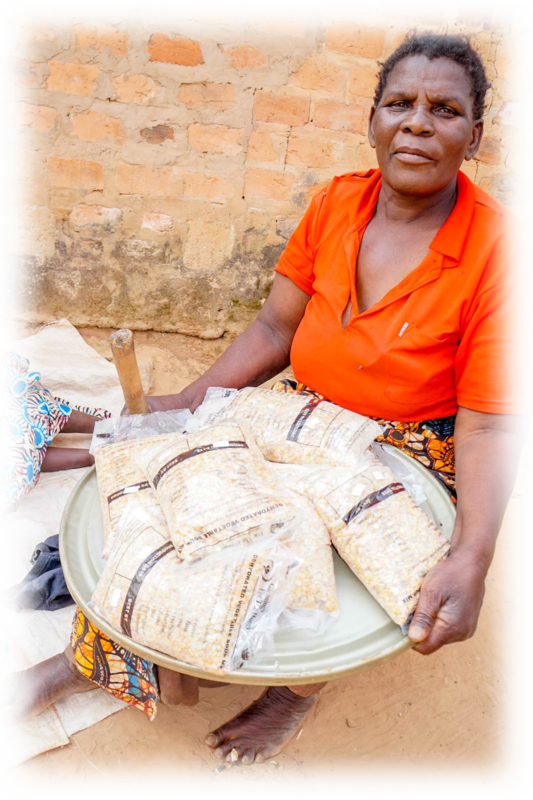 With the soup mix given to her, Beatrice’s family is able to feast on two meals a day.